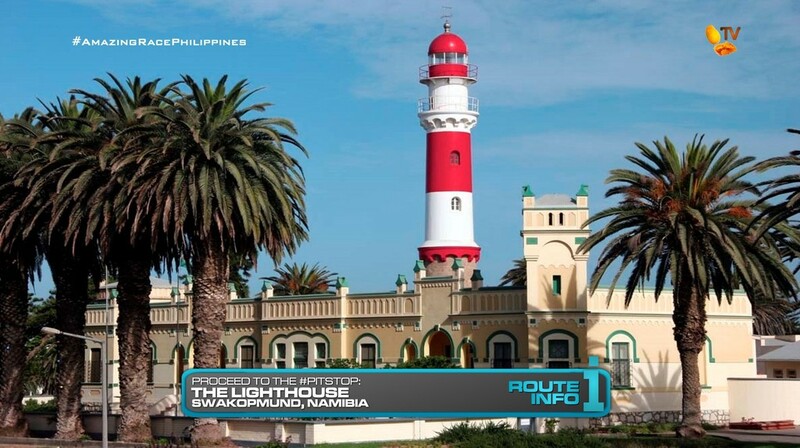 The 7th Leg of the Race starts in the early morning hours as teams must hop into one of two shuttle buses leaving at 3am and 3:30am to take them to Swakopmund, Namibia. Once dropped off in Swakopmund, teams will choose an all-wheel drive 2016 Kia Sportage and drive themselves to the flagged sand dunes outside the city. Here, teams will find a Duel Duel!!! An American remake of the classic British drama series The Prisoner was filmed here in Swakopmund in 2008. One of the most iconic images from both series is Rover, a large weather balloon-looking contraption that serves to secure the perimeter of The Village. 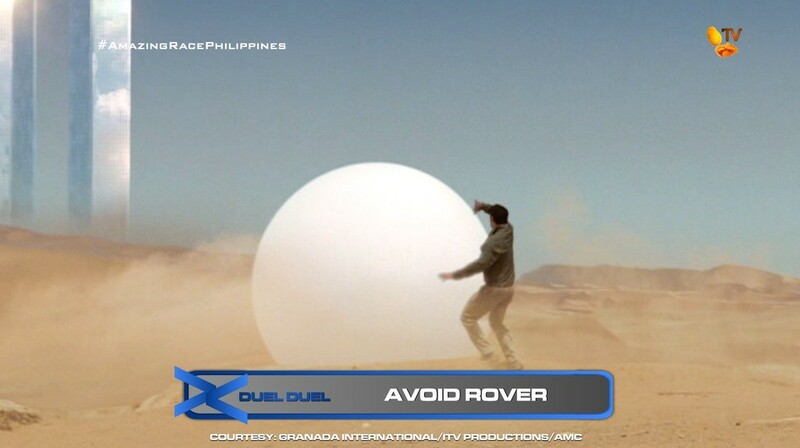 For this Duel Duel, teams will need to avoid Rover at all costs! Facing off against each other, one team member from each team will sandboard down the dunes. Their teammates will then release Rover from the top of the hill in an effort to slow down the opposing team. The winner of the Duel Duel is the team that can cross the finish line at the bottom of the hill without being touched by Rover or falling off their board. 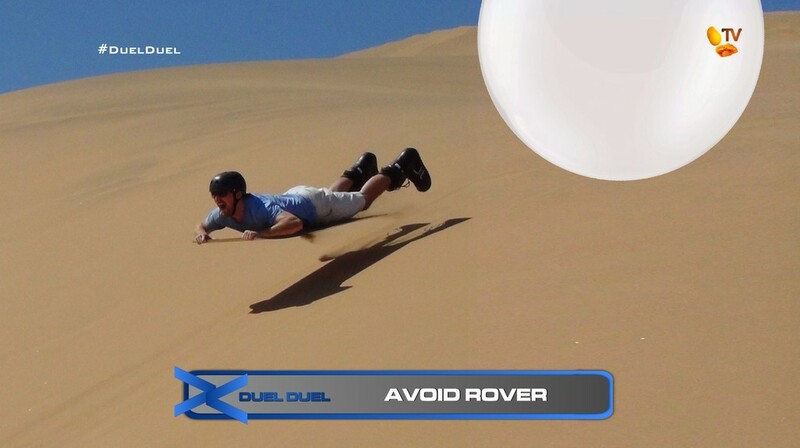 If both teams are touched by Rover, fall off their board or do not reach the finish line, then neither team wins the Duel Duel and must both go back to the end of the line. The winner of a Duel Duel will then dig in a nearby marked area for half of a wooden board they must keep with them for the rest of the Leg. After the Duel Duel, teams must drive to Ground Rush Adventures Skydiving Club in Dorob National Park. Here, teams will find a Double Road Block! Wait and See. That team member must use those coordinates with a map and compass to reunite with their teammate. Once they have reunited, they will receive their next clue. That clue reveals the Detour: Delicate Design or German Guide. 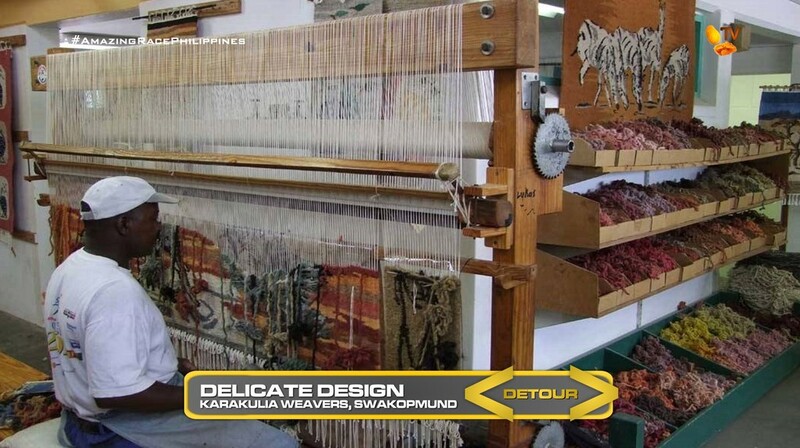 In Delicate Design, teams head to Karakulia Weavers where they will enter the workshop. They will first untangle and cleanly loom wool onto five spools. They will then help weave a section of an in progress rug. Once their work is approved, they will receive their next clue. 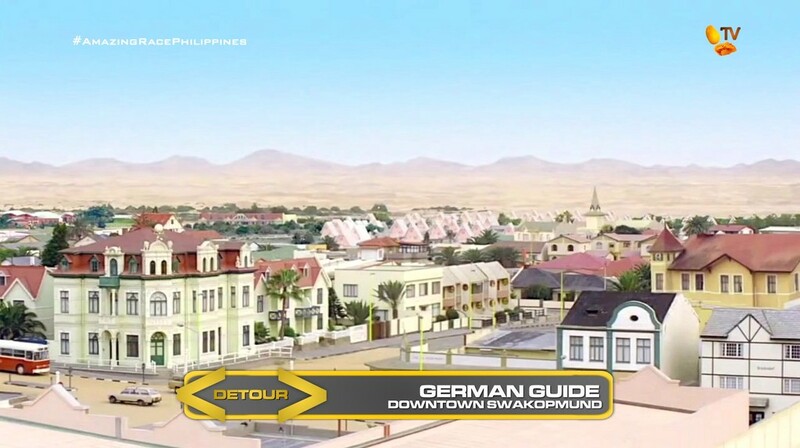 In German Guide, teams will lead a group of German tourists on foot through a few key landmarks in the area. First, they will be given a fact sheet in English with certain information needing to be translated to German, one of Namibia’s official languages, with the help of a dictionary. Once they’ve fully translated the script, they will lead the tourists through downtown. If they’ve correctly translated the information and the tourists are happy with their tour, they will receive their next clue. 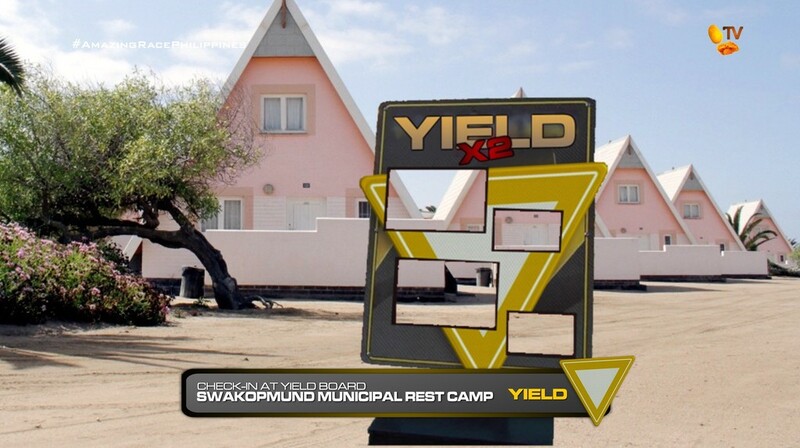 Teams will be given a photo of a distinct A-frame building. 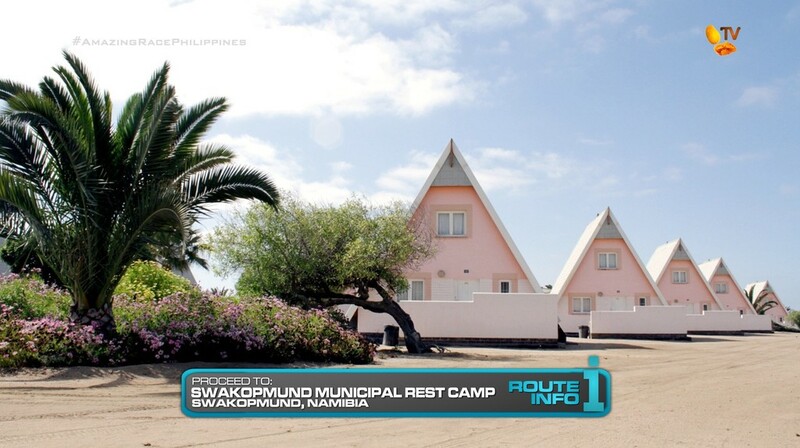 They must figure out that they will make their way to the Swakopmund Municipal Rest Camp. But teams will also need to search these A-frame homes for the other half of their wood board they obtained after the Duel Duel. Each wooden board has a distinct cut. I think this should be a really good Leg. 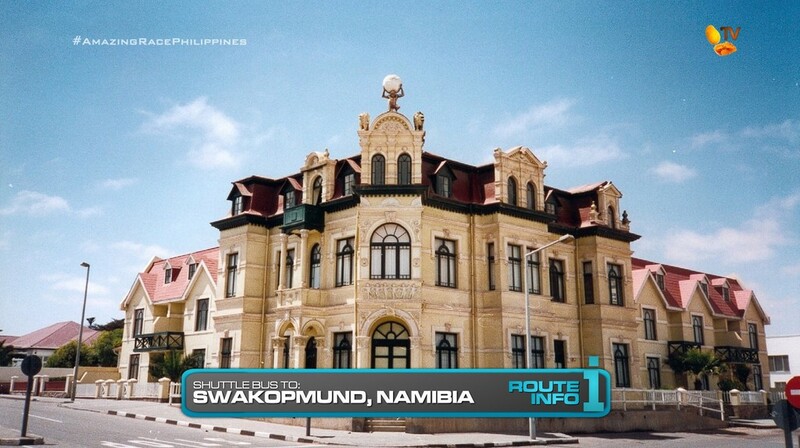 With Swakopmund, I will never forget it being The Village of the 2009 The Prisoner miniseries. 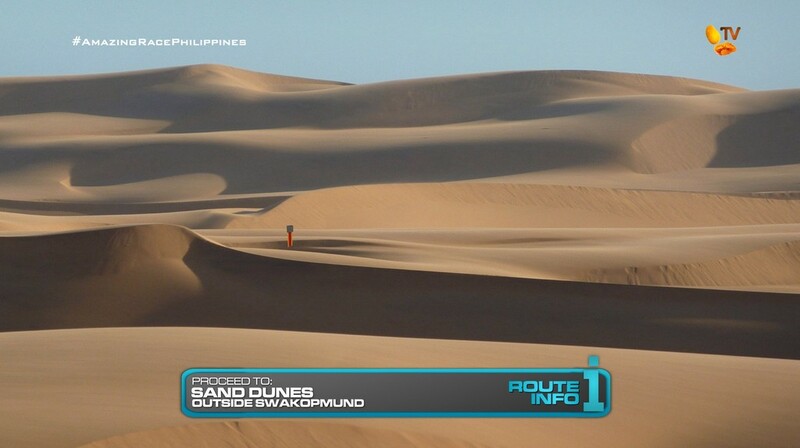 The sanddunes would look amazing in HD and with those great drones of course. So this would be a stunning location for a Duel Duel. The sliding down the dunes with huge white balloons chasing them downhill should be very exciting. And it should be great with the added caveat that both teams could end up losing each face-off. It should definitely be a lot of fun. The digging in the sand isn’t a hard, needle in the haystack task. The boards will be peeking out of the sand, so it should only take a minute. The Road Block is a modified version of TAR26’s. Making this a Double Road Block will allow for teams to not be sure about which team member will jump out of the plane since neither Wait nor See really indicates which it is. You always love when the team member with a fear of heights mistakenly chooses to do the skydiving lol. But the GPS and coordinates part of the Road Block uses what was maybe the best part of the TAR26’s otherwise boring Road Block in that teams could be wandering around for hours! The Detour should be solid. I’m not sure if it is balanced enough. But the German translating, which sounds hard on paper, shouldn’t be that bad when they will find out they only need to translate a few words. The weaving certainly seems simpler on paper, but the tour guide side of the Detour could end up being the faster task. The Yield is okay here. But the last Route Maker is basically just to get those drones flying over these interesting A-frame homes at the rest camp. They look interesting, right? The drone shots will definitely look great with teams running around these funny-looking homes. With the Duel Duel and the haystacks at the Rest Camp, this is a good Non-Elimination spot.